This kit works with all BRS 5 Stage RO/DI Systems along with most other RO/DI systems that use 10" canisters. Our filter kits feature some of the most widely used and trusted brands in the world including GE, KX Technologies, and Pentek. The 10” filter size is the industry standard and will fit our systems as well as virtually every brand of RO system that uses similar looking carbon blocks. Most of the filters included in our kits are NSF Certified or WQA Gold Seal Certified and Manufactured using FDA-compliant materials. Works great and it was a great price, what more is there. Been a few years since I have run my RO/DI system and I was a bit nervous it may not work anymore. Bought all new filter media and the filters worked perfectly. Great item. Great price for a nice 5-stage filter kit. Have purchased this kit several times and it will continue to be my go to replacement kit. Great product and cheaper than other places. The DI resin was a little messy to replace but well worth the trouble to save a little cash. Great products, great staff, very knowledgable about any issue you may hay. These seemed to be made very well and fit perfectly. Very easy to replace! Received the package well before it was expected which allowed me to service the unit in our timeline. The price was very reasonable. The shipping box could have been a bit more substantial. Can not get a better deal on RO DI items. Work great. best product hands down and price is best also I did the shopping for you! I own the standard RO unit with the DI, it's been roughly a year and I'd like to replace the necessary components in which need to be replaced within this time. Is this the correct kit to purchase? Thank you kindly. If you have the 5 stage standard unit this would be exactly the filter kit you would need! In your opnioin about how often should the filters be changed. My TDS meter consistently reads 3 or 4 on the inlet prior to my DI resin and my DI resin needs to be changed about every 6 months so just wondering about the other filters. At the least the prefilters should be replaced yearly but it really comes down to usage. The carbon blocks are good for 6000g of total water (which is waste + product) and the sediment filters should be replaced when they become dirty/clogged. If either is clogged it would generally be visible by a decrease of water pressure on an RO/DI pressure gauge. I have the 5 stage ro system. I need replacement filters but I am not sure exactly what I need. I see the kit for the five stage unit. The kit includes a bag of resin. What chamber is that for. Thanks. If you have our 5 stage RO/DI system then you would want the 5 stage RO/DI replacement filter kit. The bag is the bag of DI resin which replaces the DI resin on your RO/DI unit (the last stage). Does this kit come with a replacement ro membrane? Says 5 stage kit but I only see 4 items listed. This kit will replace the pre-filters and DI resin in a 5 stage system, but will not come with the RO membrane as that needs to be replaced less frequently. If you need to replace the RO membrane as well those can be found at the link below. Have a great day! Hi, I have The BRS 4 stage value water saver plus Ro/do 150gpd. I am needing to change all filters. Which filter set do I need? 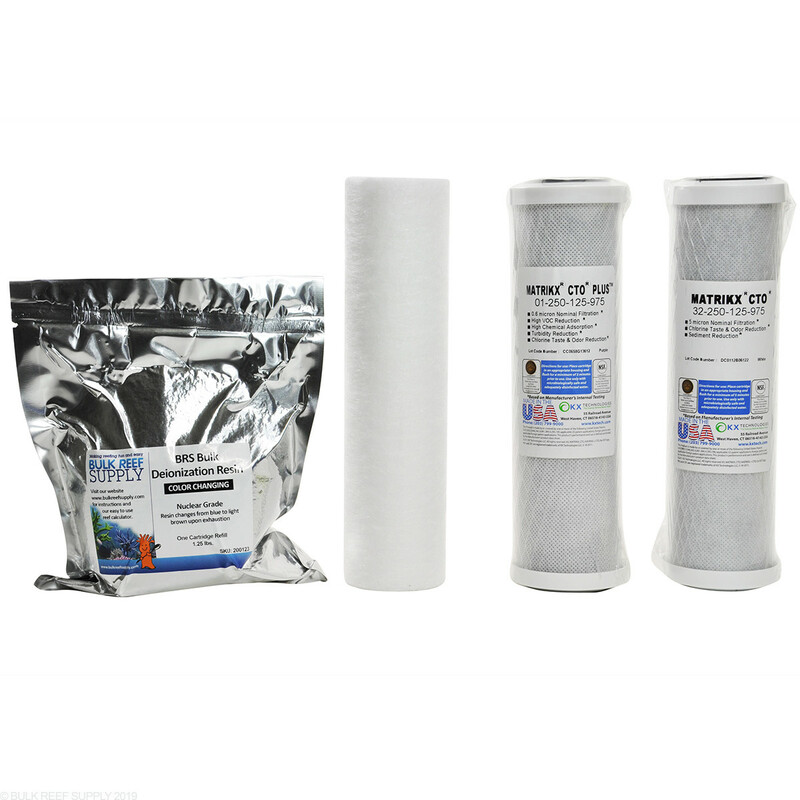 You will want the 4 stage value replacement filter kit (link below) and possibly the replacement 75 GPD membranes. I have Spectrapure 4 stage Rodi system. It's 16" canisters. You think I'll be available to use this matriks as a replacement for my unit!? Are you measuring the outside height of the canister? RO filters are measured by the actual filter inside of the canister. Traditional 10" filters will actually measure around 9.5" tall. If your filters are around 9.5" tall then the Matrikx filters should work great in your system. 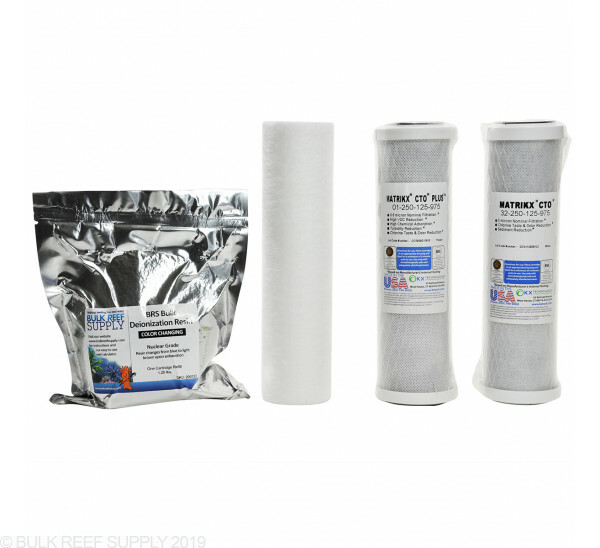 I purchased the 5 stage drinking and reef filter kit and I was wondering why im missing a filter. I have a 5 stage drinking filter system with the one di filter that is separate from the drinking unit. The replacements came with a di package, 5 micron, purtrex 05 micron, chlorine taste and odor reduction, and a .6 micron. When should I replace the other filter and where can I purchase it? It says 5 stage yet on full description I see one, two, three, and last. That only makes 4 stages how is it 5 I bought this unit used from someone and I dont quite understand the 5 stages with 4 containers. When you replace the filters in the unit you generally don't replace the RO membrane until about 2-3 years. The replacement 5 stage filter kit is meant for the 5 stage RODI, it just does not come with the RO membrane, just the sediment, carbon blocks and a refill of resin. I have the 5 stage plus system. I've produced about 10 gal a month since new April 2011. The TDS meter still reads 0 and pressure is good, but they're green, black, and brown. Do I need to replace my filters? Its best practice to replace the sediment filters and carbon blocks yearly if nothing else. Filters like the carbon blocks serve other functions like removing chlorine (which otherwise damage the membrane) and won't show up as TDS when they are depleted. Changing them on a regular basis ensures your not damaging the much more expensive membrane which otherwise should last 3-5 years or even longer. 1) I last purchased filters a few months ago. The sediment filter is a very very light brown. Yet, counter intuitively, I am seeing the pressure rise. I can easily hit 100PSI, unless I dial my kitchen sink back to about 25% output. Is this normal? 2) I've owned the entire unit for several years. In that entire time, I've never seen anything more than 1 TDS for the inlet and 0 for the outlet. No matter how long the unit goes without servicing, that seems unlikely. Is the meter faulty? 1) Eventually that sediment filter will need changing as it gets very filthy, but if the pressure is increasing that's simply because the input water is. High pressure is a good thing but you do want to turn the sink down to keep it under 80. 2) The TDS meter on the unit measures the input of the DI (which is actually the output of the membrane) and the output of the DI. Considering your high water pressure and the fact that the water has already gone through 4 of the 5 stages of filtration, its not that unsual to see a number like 0-1 on the "in" side of the DI resin. Its likely just an indicator that your tap water was fairly low in TDS to begin with. The fact that the output number reads 0 and the resin hasn't turned entirely yellow also support this. Its a good thing, most folks would love to experience this!